This article, is, without doubt, perhaps one of the most disturbing we have read in some time. 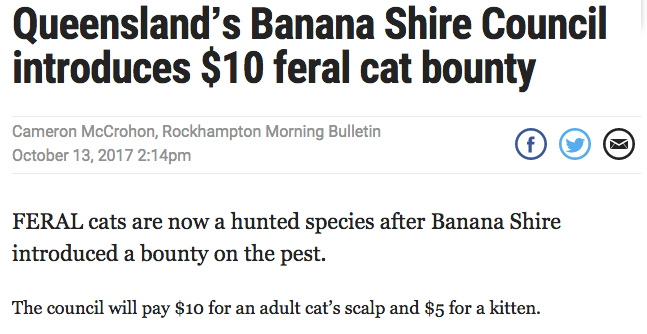 Not only will this ‘bounty’ fail dismally in its goal of reducing feral cat populations, it will, first and foremost, result in abhorrent and uncontrolled animal cruelty. This is appalling. And it must be stopped. 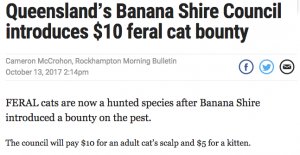 There are far more humane methods of controlling cat populations, but paying bounty hunters to trap and inhumanely kill a cat to receive money per scalp presented, is most certainly NOT one of them. Can someone please remind us as to what era we are currently living? Modern and enlightened? I think not. Join us on our Facebook Group to show your support to all cats and kittens.